This is an excerpt from Philips Research Technical Note No. 1350 entitled: Nieuwe Radiolampen Constructies (New Radio Valve Construction) by Ir. J.L.H. 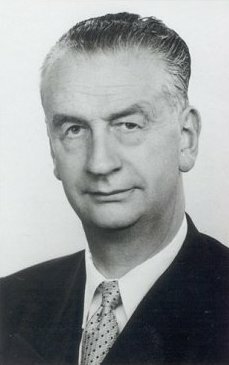 Jonker dated 22 december 1938. The period of research that this report covers if 1935-1938. I have translated the part that deals with the development of the all-glass valve literally as possible. The original in Dutch contains some very twisted sentences. This is reflected in the translation. At a few points I have added comments in . The introduction of the familiar “acorn” or “button” valve was at that time reason for us to revive an old idea, namely to try to eliminate the pinch in our old glass valves, since the length of the pinch often amounts to more than half of the total length of the valve. Since we had to accommodate the normal E-system in this new tube, we made a large type of button valve that would fit into a P-base [Ct8 base]. The grid was connected to the top of the tube through the exhaust tube to which a metal cap was cemented. A large reduction of costs was possible by elimination of the Bakelite base of the tube, which also radically avoided the problem of “loose bases.” This method to construct radio valves had several manufacturing problems which triggered experiments with pressed-glass valve bases. Pressed glass is cheap, and if we could succeed in mechanically pressing the leads into the glass base, this would result in a cheap solution. After many experiments in the glass factory it appeared that thick Chrome-iron pins that could be directly inserted in to a tube socket resulted in many problems. The bases cracked, or leaked. The lead-in wires had to be thinner and after some experiments the familiar bend pins that we know today were developed. This construction became possible after we decided to use a spigot which had been so successful in the American Octal Base valves. In this way the pins were protected against bending. When in the mean time all-metal valves were fabricated with all connections on one side, we also investigated if something similar would be possible in the all-glass valve. Although this did not seem likely because of the thick glass bottom plate (capacitances), it nevertheless appeared to be possible by using effective screening. With the elimination of the top connection, it was no longer possible to hide the exhaust tube underneath the metal cap. We looked for a construction method whereby the exhaust tube could be fabricated on the bottom side. A method was found whereby a hole was made in the glass bottom plate onto which a glass exhaust tube could be molted. By applying a small metal box around the bottom part of the valve, on the floor called “the metal trouser,” the exhaust tube could be neatly concealed, while the pins protruded through openings in this box. This metal box is part of the outer-metallization of the valve, which is sprayed and connected with the box. One of the pins of the tube is connected with the metal box. Because of all these modifications the development of the all glass tube was delayed and we see now that also others have thought of this concept. An example is the recently introduced Sylvania (Philco) television-valve, which (in a very bad embodiment) resembles our all-glass valve, and the small model Magic-eye made by R.C.A. which uses also a glass bottom. The development of the all-glass valve has now advanced to such a state that several special valves for television have been introduced, while the introduction next year, of the normal valve series [for radio] in this envelop is seriously being contemplated. In order to gain some experience with the all-glass valve, one receiver type in Holland will be equipped with a single all-glass valve. In order to convince Telefunken of the possibilities of pressed glass, they have fabricated amplifier tubes and rectifiers with a pressed-glass base, underneath which still a normal socket was cemented. It is expected that the all-glass valves will be significant cheaper than the traditional glass valves and metal valves. Additionally, they have better properties for short waves. 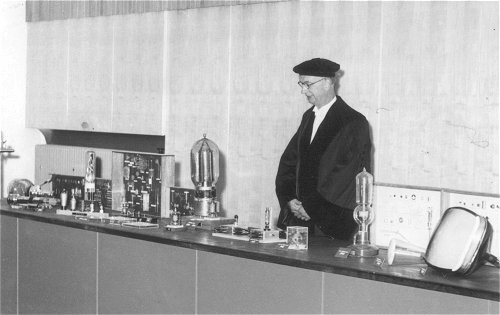 When he accepted his professorship at the Technical University of Delft.